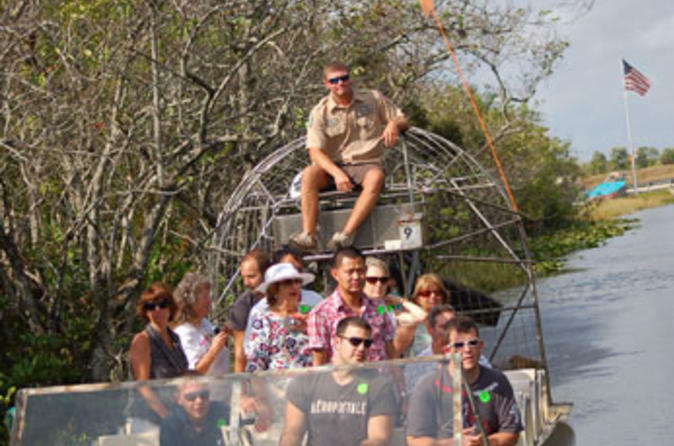 After being picked up from your Miami hotel, your combination tour starts as you board the bus for a short drive to the Everglades, where you’ll have an airboat adventure! Your 30-minute airboat ride through the wilderness of the Everglades includes full narration from your airboat captain-guide. On the ride, watch for alligators, native flora and other exotic wildlife, all in their natural habitat. Then, return to Miami for the second part of your day – the city tour. Before your city tour begins you will have free time in Bayside Marketplace where you can have lunch (not included). On the city tour, view top Miami attractions as your driver-guide navigates the not-to-be missed districts of Miami Beach, downtown Miami, Coconut Grove, Coral Gables and Little Havana. See Art Deco architecture, mega-mansions, beautiful beaches and the tropical city skyline, and hear about the art, music, diverse population, famous residents and cosmopolitan mystique that make up Miami.